Illustrators illustrate logos, but in order to create an illustrative logo an illustrator must also design the logo. Designers design logos, but in order to produce an illustrative logo a designer must hire an illustrator. At this point an understanding of what constitutes a logo is probably in order, in other words, what a logo is. And along with that, what a logo is not. There two basic types of logos and an entire gamut of subtypes in between. On the far right of the spectrum are pictorial logos that belie their meaning with their imagery. An example of this would be an illustrated cow that represents a butcher. The opposite extreme would be a symbolic approach to a logo. These logos are symbolic through an abstraction that conveys a suggestive message. An example of this would be a set of rectangles and spaces that represents the basic binary code behind all computing for a high tech company, as in the case of the updated IBM logo. Physically, a logo is a picture that is meant to be an iconic representation of an entity such as a company, product, event, or individual. It can also serve as a symbol for a concept. The purpose of the picture, or logo, is to be a unique visual form that has an exclusive association with any of the above for the intention of establishing a singular identity for marketing purposes. Building upon this concept of identity, companies use logos as “corporate identities” to provide a visual reinforcement for their names. Corporate identities also display symbolic, narrative, and/or metaphoric associations to produce exclusivity. Illustrator’s can be particularly effective in providing the imagery within a logo to establish an association or message. As previously alluded to, even within special logo categories, logos can take a variety of forms depending on the subject they represent and how they must function. For instance, a corporate identity can conceptually be interpreted in any way appropriate to the company, it can be a logo, logotype, or emblem. However, as a corporate identity, a logo must be created to function in a very adaptable manner for it will most likely have to be used black only, grey scale, monochromatically, in full color, in enhanced color, dimensionally, and even as an animation. It will be printed extremely small, say on bank checks, and extremely large, say on a banner at a sports event. It will be used digitally at a wide range of sizes from an extremely small ad banner at the bottom of an iPhone app, to a full screen splash page. A logo may even have to be applied to clothing as well as other novelty items such as coffee mugs, key chains, and many more. For all logos, at least some portion of these varied uses will apply. Logotypes are identities where the visual customization manifests itself in the structure of letterforms. Logotypes can be purely stylistic or can be suggestive of a metaphorical or narrative message or representation. Logotypes can be names, initials, or even single letters that signify a subject. A lettermark logotype is a symbol that is primarily comprised of a single letterform or a set of initials. Similar to a wordmark, the form of a lettermark relies heavily on letterform convention. Because lettermarks are abbreviations of names, there is more freedom in regard to styling and customization because a lettermark contains so few letters. So, for example, a lettermark that contains letters that are made up of a combination of curved and perpendicular strokes can be altered so the contrasting forms take on a structural similarity, as is the case with the ABC logo. Many times, the decision to go with a lettermark rather than a full name is based on the visual aesthetic possibilities for a logotype. Manhattan Laundry lettermark by Don Arday. American Broadcast Corporation initial mark by Paul Rand. Cable News Network initial mark by Anthony Guy Bost. A wordmark logotype is a symbol that is primarily comprised of letterforms that have been altered and arranged in a customized manner. Good logotypes follow either traditional proportioning and/or visually pleasing aesthetics of letterform construction and anatomy. Whether a logotype uses an existing font or creates custom designed letterforms, an understanding of letterform proportioning and the application of letterform conventions are important. Resume reviewers and particularly designers are acutely aware of inappropriate “bastardizations” of existing letterforms, or poorly drawn versions of the alphabet. So if a logotype is used for purposes of identity on a resume, for the sake of legibility and aesthetics, it should follow letterform convention as a guide for any customization. Canon Corporation workmark, designer unknown. Walt Disney Corporation name mark by Mr. Walt Disney. Logos differ from logotypes in that they are purely pictorial in nature, whether or not they appear more illustrative or more abstract and symbol-like. Logos are very personalized visuals that represent their respective sponsors. When creating a logo with abstract forms to be a unique identifier and for visual interest, any symbolism within the logo should be projected to a viewer through its appearance. These iconic abstracts must work for the audiences they serve even if those audiences are not visually acute. Logos that are too abstract can loose or confuse a viewer. Symbolic abstractions, which communicate as plain as day to an illustrator, designer, or client, may look like a foreign language to the client’s audience or customers. Abstract logos often rely on visual illusionism and the interplay of positive and negative shape relationships. Since there is often misinterpretation concerning a message or narrative that is to be imparted by an abstract symbol, one might ask, what the purpose is in creating an abstract logo. Abstract logos are best suited for representing large very diverse companies. For example, the Japanese company Mitsubishi manufactures automobiles, aircraft, audio and video equipment, chemicals, steel, sewing machines, phones and much more. 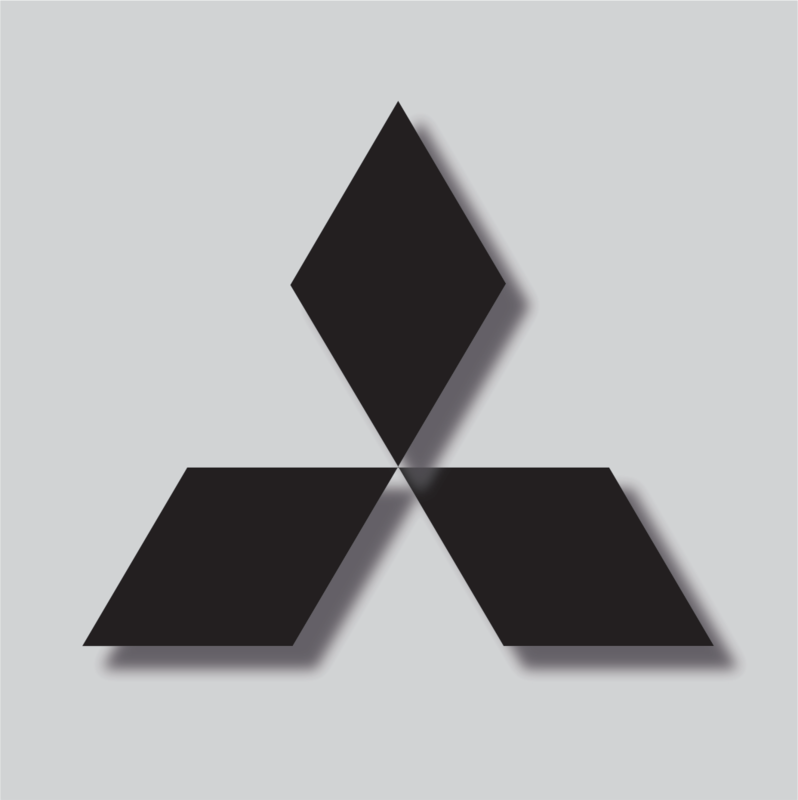 A pictorially representative logo would either, have to be extremely complex, or exclude a great number of products that Mitsubishi manufactures. So an abstract symbolic logo functions much better under the circumstances. National Arts Centre abstract logo by Ernst Roche. Woolmark Company abstract logo by Franco Grignani. The name "Mitsubishi" refers to the three-diamond emblem. "Mitsubishi" is a combination of the words "mitsu" and "hishi." "Mitsu" means three. "Hishi" is used to denote a three-sided parallelogram or rhombus diamond shape. As customary, "hishi" is pronounced "bishi" when it forms a latter part of a word, hence the combination of "mitsu" and "hishi" reads "mitsubishi." Mitsubishi Corporation abstract logo, artist unknown. In the 19th century, businesses used pictorial logos to quickly identify the products or services they provided. Logos functioned not only to identify a company and its offerings, but they did it for both the literate and illiterate populous. For example, a fishmonger would have an image of a fish on the sign that identified his business, so anyone, even foreign and immigrant customers, unfamiliar with the local language, understood the nature of the business. Since then, pictorial logos have remained in constant use, but have progressed far beyond the purpose of pure business indexing and identity, These logos now project personality, economic status, marketing specialization, regionalism, etc. Pictorial logos require the skills and expertise of those that create pictorial works, whether they are based on realistic drawing, or on stylized or characterized versions of subjects. The greatest success comes from illustrators, particularly those that have spent hours drawing the figure, still life objects, and scenes, and those who have experience developing characterizations of subjects. Greyhound Transportation picture logo by Raymond Lowey. Major League Baseball picture logo by Jerry Dior. Turner Classic Movies picture initial mark by Michael Schwab. The Leo Burnett Agency of Chicago arguably can be credited with the popularized success of character branding. Uncle Ben, the Jolly Green Giant, Tony the Tiger, Nine Lives’ Morris the Cat, Charlie the Tuna, the Pillsbury Dough-Boy, the Marlboro Man, and many more, were all Burnett inventions. The implementation of these character based advertising campaigns required hiring illustrators who were kept on staff. Burnett also outsourced to other companies and freelancers for production of the characters. Pillsbury Dough-Boy picture logo by Martin Nodell. An emblem is a type of identity that combines words and visuals. The visual elements can be in the form of any class of illustration, symbol, and/or graphical device. Descending from the medieval coat of arms and family crest, emblems have been used for centuries to represent not only conventional lineage, but also any number of subjects. Today emblem logos are used to identify and market companies, products, services, events, teams, clubs, organizations, and more. Just as logos and logotypes can be, an emblem can be used for any subject requiring a visual identity. Pringles Brand emblem by Louis R. Dixon. Emblems, due to the fact that they contain both words and visual elements are more complex in structure than logos or logotypes. Emblems that combine words, illustrations, and graphical devices can be highly complex in their configuration. The combination of these elements affords an identity with both pictorial appeal and informational exactness. Another result of the complexity involved with emblems is that their function is more limited than that of logos or logotypes. Emblems do not function as well as the other identity types do at very small sizes. However, emblems are generally not lacking in visual interest, and work very will when it comes to specialty merchandizing. In fact, many companies whose identities are conventional logos and logotypes also develop emblematic versions of them just for this very purpose. These emblems are then applied to wearable items and other forms of products to further sales revenue and reinforce brand recognition. Dallas Mavericks emblem by The Propel Group. Starbucks Coffee Company emblem, designer unknown.